A bedroom is more than just a place to sleep. It�s a special space, a private quarters where one can play, dream and grow. Whether it�s dreams of heroic princes vanquishing dragons or of screaming fans cheering from the stands, we have all the furnishings you need to fashion a room to reflect your child�s personality and interests. Do you wish to create a classic room in whisper soft colors? Do you imagine a bold contemporary space that knocks? We�ve got Chandeliers, Lamps, Rugs, Wall Art, Growth Charts, Mirrors and more � in an eclectic array of styles to help you create a room where the imagination soars. 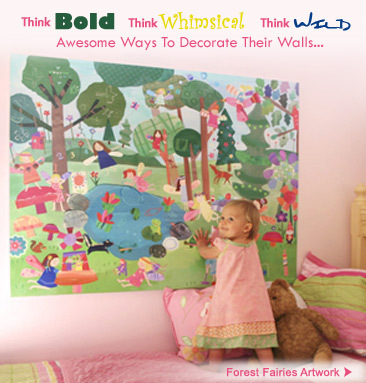 Planning your dream nursery? Our trained customer service representatives are ready to help!